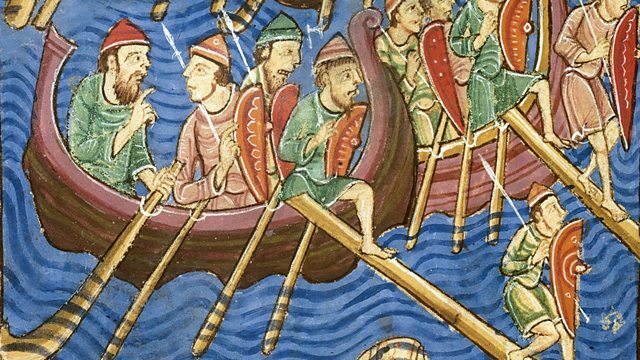 Melvyn Bragg and guests discuss how a series of Danish invasions, settlements and battles with Anglo-Saxons changed England in the 9th and 10th centuries. Melvyn Bragg and guests discuss the effective partition of England in the 880s after a century of Viking raids, invasions and settlements. Alfred of Wessex, the surviving Anglo-Saxon king and Guthrum, a Danish ruler, had fought each other to a stalemate and came to terms, with Guthrum controlling the land to the east (once he had agreed to convert to Christianity). The key strategic advantage the invaders had was the Viking ships which were far superior and enabled them to raid from the sea and up rivers very rapidly. Their Great Army had arrived in the 870s, conquering the kingdom of Northumbria and occupying York. They defeated the king of Mercia and seized part of his land. They killed the Anglo-Saxon king of East Anglia and gained control of his territory. It was only when a smaller force failed to defeat Wessex that the Danelaw came into being, leaving a lasting impact on the people and customs of that area.